Well, you've made it to the Engine bay! In a fire station, the engine bay is the big garage where all the fire engines and ambulances, as well as other specalized vehicles, are kept, waiting in the wings for the next alarm. In Cyberpsycho's firestation, the hose tower is connected to the engine bay. The hose tower is a room with a 30 foot high ceiling, a number of hooks at the top, and a spiral staircase all the way to the top. This room is used to hang wet hoses, and those hoses which are currently not in use. The staircase, aside from being used to get to the top of the tower, can also be used for things such as repelling drills and rope tying skills. Here at the engine bay of Cyberpsycho's fire station, we have a number of fire units that are in service. This means that they are currenly available to respond to an emergency. To see a number of pictures of the units stationed here, check out the picture page. If you'd like to hear the siren on one of the units, click here! "Never play basketball with a firefighter if you plan to win. No matter what the odds, they will never give up, and in the end, will emerge victorious." Very early one Saturday morning, while I was on duty as an EMT for RIT ambulance in Rochester New York, we got a call for an unresponsive male lying on the floor of a college dormitory elevator lounge. According to one dispatcher, the man was discovered by a maid who was pretty sure "the poor soul was dead". Being on the university ambulance corps we often got calls for unresponsive students lying hither and yon, who had drank too much, and passed out with varying degrees of alcohol poisoning. Some students just needed to be woken up, while others ranged from unresponsive, to full respiratory arrest. From what the dispatcher had said, this one sounded very dead. When we arrived on the scene, we quickly hopped in the elevator and hit the button for the fifth floor. When the doors opened again, we were stunned by what we saw. The maid was dutifully vacuuming.. right around the body and between his appendages as if he were a table. My partner yelled to me, "He must be dead to endure all that noise!" But after tapping him on the shoulder a few times, the "dead" college student gently blinked his eyes, stretched his arms, and then motioned something with his hands.... sign language! No wonder, he was hearing impared! Story courtesy of Galls "In The Line Of Duty"
A funeral service is being held for a fire chief who has just passed away. At the end of the service the pall bearers are carrying the casket out when they accidentally bumped into a wall, jarring the casket. Hearing a faint moan, they opened the casket to find the chief still alive. He returned to work and lived for ten more years, before finally passing on. At the next funeral (again held at the same place) the pall bearers were once again carrying casket out. 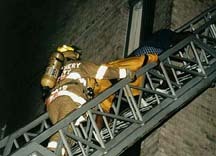 As they are walking, a firefighter jumped up and yelled, " For goodness sake watch out for the wall!!"